At work, especially in the project context, we rely on each other's Word. When someone tells you something, you need to know that you're hearing what the speaker believes to be true. We can each help to create a more Truth-Full working environment by telling the Truth ourselves, especially when the prospect of telling the whole truth seems scary. (This is a good thing. 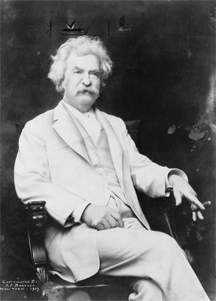 )Mark Twain wrote, "If you tell the truth you don't have to remember anything." This is one of many advantages of telling the truth. Here's a list of the advantages of telling the truth over spinning, shading, stretching, misleading, or even lying. Mark Twain in 1907. Photo by A.F. Bradley, courtesy U.S. Library of Congress. Telling the truth requires less creativity because you don't have to make anything up. Telling the truth reduces medical expenses by keeping your blood pressure in the normal range. If you tell the truth you don't have to worry whether what you're saying now is consistent enough — or too consistent — with what you've said in the past. If you tell the truth it's less likely (though not impossible) that anyone will accuse you of not telling the truth. If you tell the truth you have to do much less record-keeping — it's easier to remember what you told to whom and when. You hardly ever feel guilty about telling the truth. If you tell the truth you don't have to worry as much about whether what you're saying is working. If you tell the truth you don't have to worry about what to say when you get caught. If you tell the truth you don't have to learn any fancy ambiguous words to mislead people. The plain truth is usually shorter than anything else. If you tell the truth you get practice telling the truth, which can pay off when telling the truth is really hard. If you tell the truth it's more likely (though not certain) that others will tell you the truth. If you tell the truth your nose won't grow much beyond its current length. If you tell the truth you don't have to worry about keeping a straight face. If you tell the truth you have less need to explain to yourself — or your kids — why it's sometimes OK not to tell the truth. If you tell the truth, people have a chance to find out about problems while there's still time to do something about them. If you tell the truth it's easier to sleep at night. If you're known as a straight shooter, fewer people will ask you to shoot crooked. If you tell the truth often enough, when you say something, people are more likely to actually believe you. Would you like to see your comments posted here? rbrenBqXUleiFPlwqhJDEner@ChacysoEwlKHmykVSifhoCanyon.comSend me your comments by email, or by Web form. Sometimes when we notice wrongdoing, and we aren't directly involved, we don't report it, and we don't intervene. We look the other way. Typically, we do this to avoid the risks of making a report. But looking the other way is also risky. What are the risks of looking the other way? When we influence others as they're making tough decisions, it's easy to enter a gray area. How can we be certain that our influence isn't manipulation? How can we influence others ethically? Opportunities come along even in tough times. But in tough times, it's especially important to distinguish between true opportunities and high-risk adventures. Here are some of the attributes of desirable political opportunities. People have been deceiving each other at work since the invention of work. Nowadays, with telephones ever-present, telephonic deceptions are becoming more creative. Here's Part I of a handy guide for telephonic self-defense. The Seinfeld character "George Costanza" is famous for having said, "It's not a lie if you believe it." What if you don't believe it and it's true? Some musings. See also Ethics at Work for more related articles. I offer email and telephone coaching at both corporate and individual rates. Contact Rick for details at rbrenBBfVuYpArkvTkBOIner@ChacdRzoVSdnsSovugNBoCanyon.com or (650) 787-6475, or toll-free in the continental US at (866) 378-5470.